The 2018 Mustang GT’s power specifications have been known for months and though fuel economy is not expected to dramatically increase across the board, many have been eagerly anticipating the MPG numbers for the new transmissions. One Mustang6G member discovered the window sticker of a 2018 Mustang GT with the 10-speed automatic transmission now shows the new vehicle will get a mild bump in fuel economy even with its +25 horsepower and +20 lb-ft of torque increase over the 2017 model. That means the 2018 Mustang GT auto gets 16 city / 25 highway / 19 combined miles-per-gallon compared to the 15/25/18 MPG of the outgoing 2017 Mustang GT when equipped with the 6-speed automatic transmission. 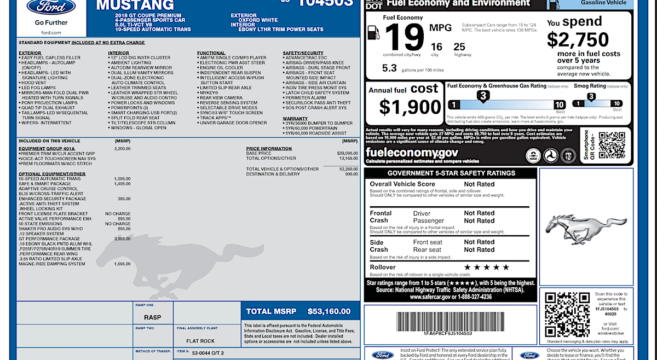 Check out this 2018 Mustang GT window sticker for fuel economy and other details.